Today, 240 videos from TED Ed were made available in the Open Educational Resources collection in the NCLOR. TED-Ed is TED’s (Technology, Entertainment and Design) youth and education initiative. Most of the resources made available are TED-Ed Originals. These resources are short, award-winning animated videos about ideas that spark the curiosity of learners. The videos also include quizzes, more detailed information, and a discussion area under the: Think, Dig Deeper, Discuss links respectively. Some of the subjects included in this series are: mathematics, biology, history, literature, and health. All TED Ed content available in this series is free to use and is licensed under a Creative Commons Attribution 4.0 International License . The NCCCS courses that these resources may supplement are; ANT220, ANT230, ART111, ART114, ART115, BIO094, BIO110, BIO120, BIO230, BUS225, CHM090, CJC111, CJC231, CUL150, DAN110, EGR110, EMS3000, ENG101, ENG131, ENV120, HIS111, HIS112, HIS115, HIS132, HIS145, HIS211, HIS212, HIS221, HPT3100, HUM120, MAT141, MAT3713, MSC160, MSC172, MUS110, PHI210, PHI215, PHM265, PHY101, POL110, PSY101, and REL110. Since these resources are open, you can access the series via Guest Access here: TED Ed or log into the NCLOR and click on the More button on the left menu bar. Then click the Resource Series link and then click the TED Ed link. 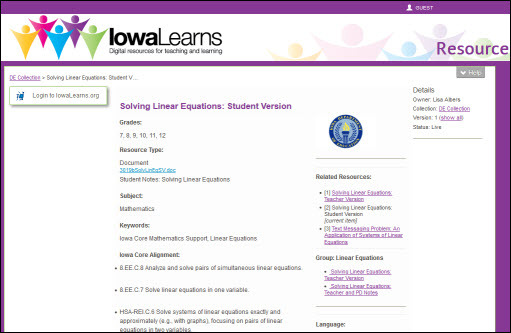 Today, 6 new eTextbooks were added to the open educational resources collection of the NCLOR. Open SUNY Textbooks is an open access textbook publishing initiative established by State University of New York libraries and supported by SUNY Innovative Instruction Technology Grants. This pilot initiative publishes high-quality, cost-effective course resources by engaging faculty as authors and peer-reviewers, and libraries as publishing service and infrastructure. The NCCCS courses that these resource may supplement are: BUS240, ECO151, EDU152, EDU253, EDU280, ENG111, ENG125, ENG126, MAT167, NUR3218, and NUR3252. Today, over 830 resources from the Extended Learning Institute (ELI) from Northern Virginia Community College System (NOVA) were added to the NCLOR’s open educational resources collection. Pioneering zero textbook cost courses and degree programs since 2012, Northern Virginia Community College (NOVA) is the first community college to fully share its OER degree pathways and courses for others to use and build on. NOVA’s Extended Learning Institute (ELI) and Lumen Learning have teamed up to make these courses and degree pathways broadly available to the education community. These courses fulfill all requirements for NOVA Associate’s degrees in General Studies and Social Sciences. Published with open, Creative Commons licenses, anyone can freely use, revise, remix and re-purpose the courses. The resources from eight NOVA curriculum courses were added. The courses added were: Principles of Macroeconomics, Introduction to the Study of Religion, Music Appreciation, Mathematics for the Liberal Arts II, Mathematics for the Liberal Arts I, College Composition I, Introduction to Computer Applications and Concepts, and Introduction to Communication. The NCCCS courses that these resource may supplement are: MAT3713, MAT110, MAT122, MAT142, MAT143, MAT152, MAT252, MAT141, MAT167, MAT263, ECO252, REL110, MUS110, DMA050, DMA030, CIS110, COM110, and ENG110. Log into the NCLOR and click on the More button on the left menu bar. Then click the Resource Series link and then NOVA Open Courses. NROC hosted an informational webinar on October 29th. This webinar reviews the vast collections available from the NROC Project through the NCLOR. Beth Pickett, NROC Project HippoCampus Product Manager, provides a whirlwind tour of some of the 3,000 + objects across subjects. Jonathon Sweetin, NCLOR Systems Administrator, demonstrates how to easily include objects from NCLOR into your Blackboard or Moodle courses. The NROC Project is a community-guided, non-profit project focused on new models of digital content development, distribution, and use. Run time apx. 54 minutes. The NROC project collection in the NCLOR is only available to the NCCCS faculty.